No business is immune from change and while digital disruption is the current buzzword driving industry transformation initiatives, there’s a sleeper issue brewing behind it: adaptation to climate change. The evidence is beyond doubt that the earth is warming at an unprecedented rate and that humanity’s use of fossil fuels (plus other factors such as widespread land clearing and our addiction to concrete) are to blame. While we’ve started tentatively on the road towards a near zero carbon economy with steps to transform the energy sector, it’s too little and too late and climate change is going to get a lot worse long before it gets any better. Accordingly, we need to prepare for searing heat waves, parching droughts, intense storms, retreating glaciers, rising sea levels, plus warming and acidifying oceans. That means huge disruptions to global food and water supplies, collapse of ecosystems, a range of new health challenges, displacement of populations and massive urban infrastructure challenges. And as the scale of these problems become increasingly apparent, there will be a broadening of societal backlash against industries that continue to peddle products and services that damage our environment, followed by government action limiting their license to operate or imposing punitive costs. But in adversity lies opportunity for innovators that grasp the concept of climate change as a market disruptor. 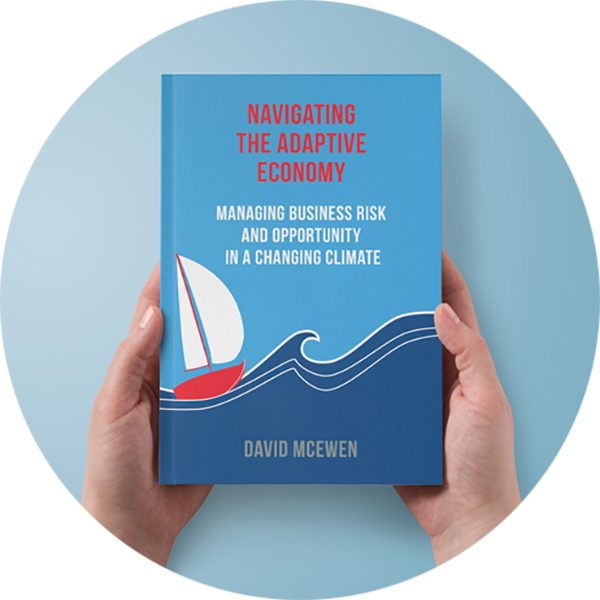 That’s the concept behind a new book by David McEwen, a Director at strategic consultancy Adaptive Capability. 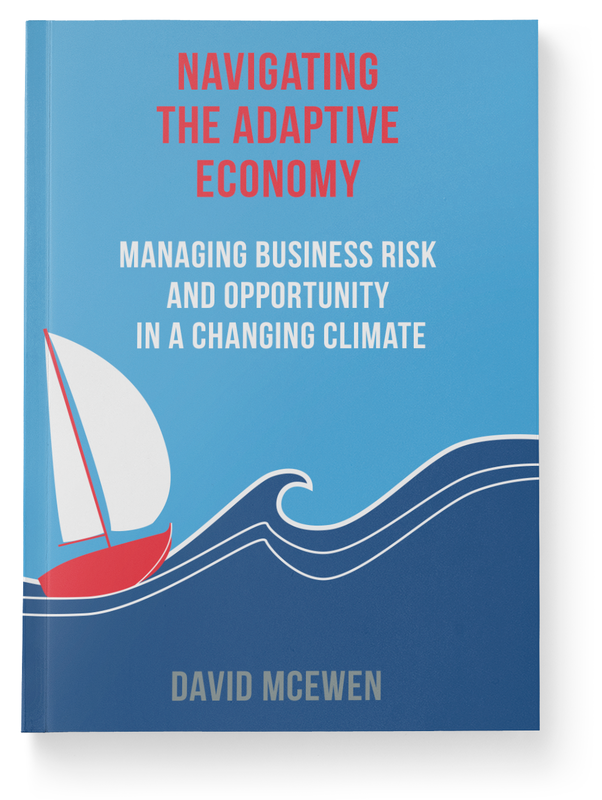 Navigating the Adaptive Economy – Managing Business Risk and Opportunity in a Changing Climate helps business leaders understand what a changing climate might mean for their organisation and the products and services it produces. Packed with tools, data and case studies, it will inspire planning to build business resilience and make the strategic decisions that can open up new revenue streams and benefit reputation. The book catalogues a wide range of products, services and jobs that will be increasingly demanded over the coming years and decades, some existing but others requiring significant innovation. It also helps businesses assess whether their current product/service portfolio might be threatened from climate disruption. While some implications of adaptation are obvious (the need for coastal protection and a declining alpine sports industry), others are more subtle such as innovation in water purification and measures to arrest the spread of tropical pests. 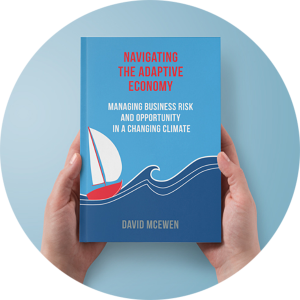 As well as ensuring that a business’ products and services are fit for a climate changing world, Navigating the Adaptive Economy also considers how businesses themselves may need to change their behaviours and processes in order to remain competitive. Available as paperback or Kindle on Amazon.